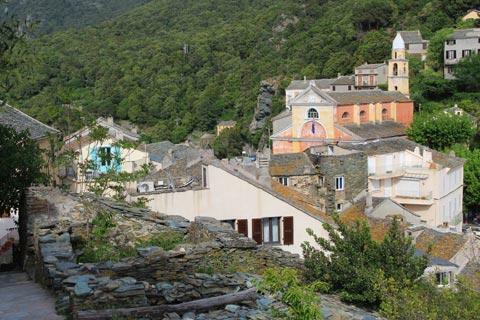 Nonza is the last important village you reach as you travel around Cap Corse - it is to the south-west of the peninsula - and is a nice place to end your tour with a pretty church, an ancient tower and lovely views to enjoy. Because of its position on the side of a cliff, parking at Nonza is a bit of a challenge and you will need to find a place somewhere along the main road outside the village. Start your visit with a stroll around the village itself. The principal monument is the 16th century Church of Sainte-Julie, dedicated to a Saint who was martyred in Roman times and whose relics were later brought to the village. 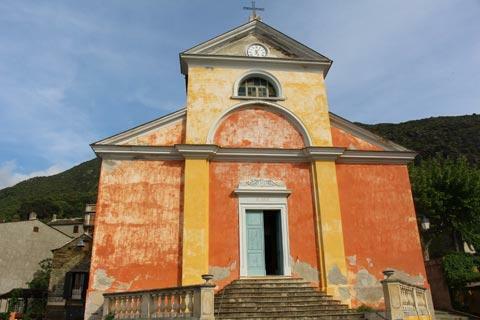 The church is now in the classical style and painted a bright orange. Inside the church it is the painted ceilings and the altar that are the main items of interest. You can also see the small Chapel of the Confrerie Santa-Croce next to the church, and around these two buildings there are a few small streets of ancient stone houses and a central square with cafes. Outside this central area of Nonza you can see further streets with houses clinging to the cliff above Nonza. 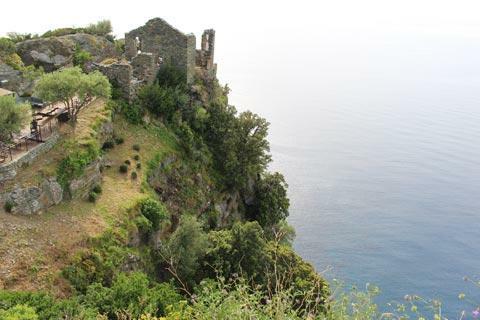 The main attraction in Nonza, and that dominates most views of the village, is the ruined castle and tower on the top of the cliff at the edge of the village. This is a very short walk from the village centre. 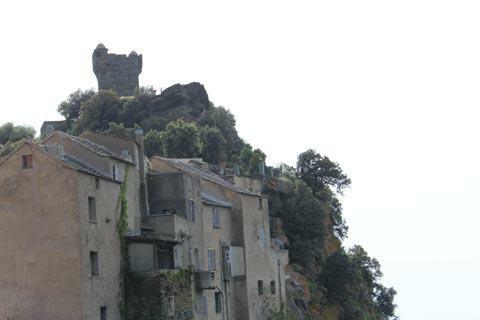 As early as the 12th century there was a castle in Nonza, but this was destroyed by the Genoese in 1489, and only a few ruins can still be seen. 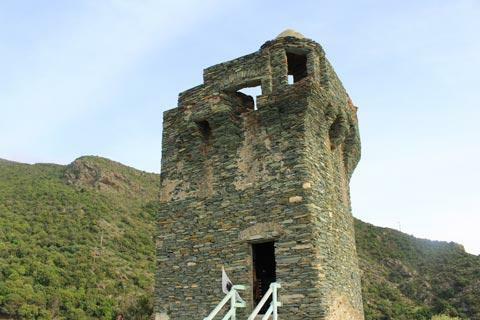 The tower we see today was built as a watchtower in 1760 by Pascal Paoli, the leader of the battle for Corsica independence in the 18th century. You can visit the interior of the tower, but unfortunately it is not possible to access the top level. Anyway it is the views along the coast, and of the beach below as seen through the Trou de Diable, that is the main attraction. 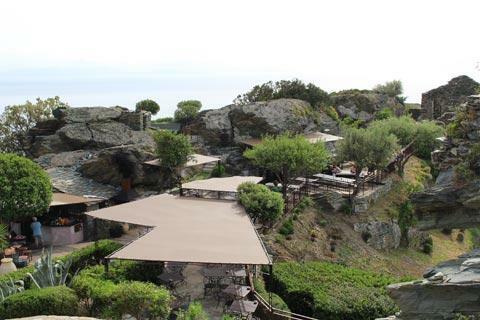 There is a cafe in a lovely position among the rocks of the headland next to the tower. There is also a long beach in Nonza although its grey colour is a bit offputting. This colour is apparently due to black asbestos waste from the large abandoned asbestos mine (it closed in 1965) you will have noticed blighting the landscape a few kilometres north of Nonza. The experts say the beach is safe to sit on, although the currents make it unsafe for swimming, but I am guessing that the combination of the colour of the sand and the knowledge that it is due to asbestos waste deters all but the most hardy sunworshippers. A popular activity is to write messages or draw pictures using white stones on the beach that can be seen from the tower high above. It is worth walking down towards the beach, however, both for the view up to the village and tower and also to see the Fontaine des Mamelles, a spring that apparently began to flow at the time of the martyrdom of Saint-Julie and has never stopped since. 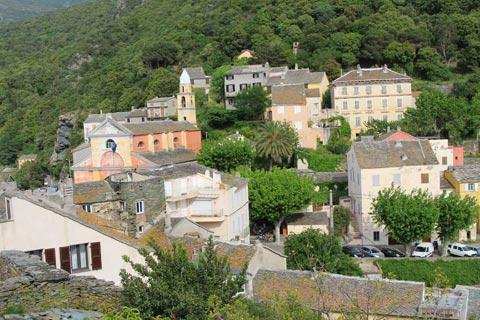 The main attraction here is the chance to enjoy the beautiful coastal scenery of the western Cap Corse. Apart from the unsightly asbestos mine just outside Nonza there are many places where you can look down on attractive Mediterranean coast. Numerous cyclists also enjoy this stretch of coast so take care when driving!